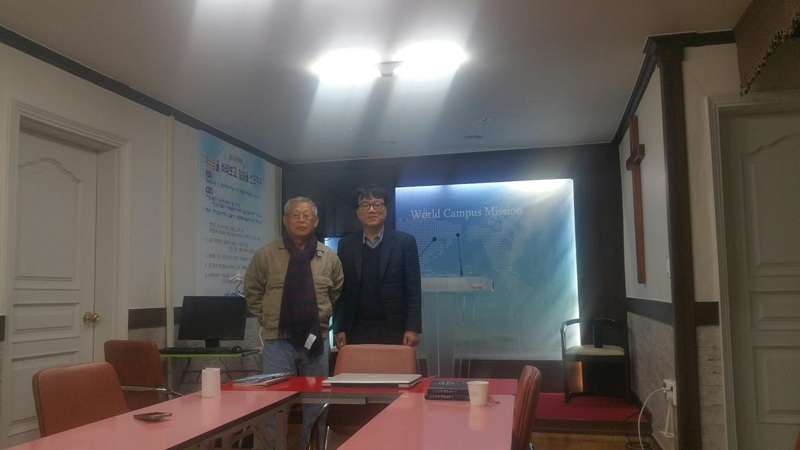 On Feb 22, 2016 on the way back to Seoul we (I and Shepherd Timothy Ha) paid a visit to Shepherd Abraham Cho at the Soon Cheon UBF Center. 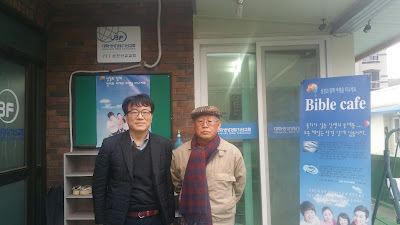 Missionary Stephen Cho of Bolivia. He started to pioneer Sooncheon National University 3 years ago. Several students faithfully study the Bible and attend Sunday worship. 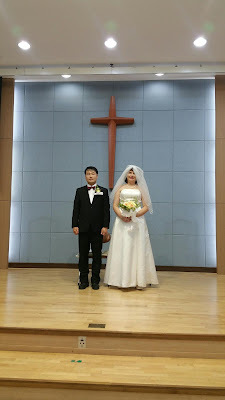 He majored in design but now as a pioneer he does a number things like (during worship service) presiding, leading worship services by playng guitar, making announcement, serving messages, singspiration, cleaning Bible center which he rented. 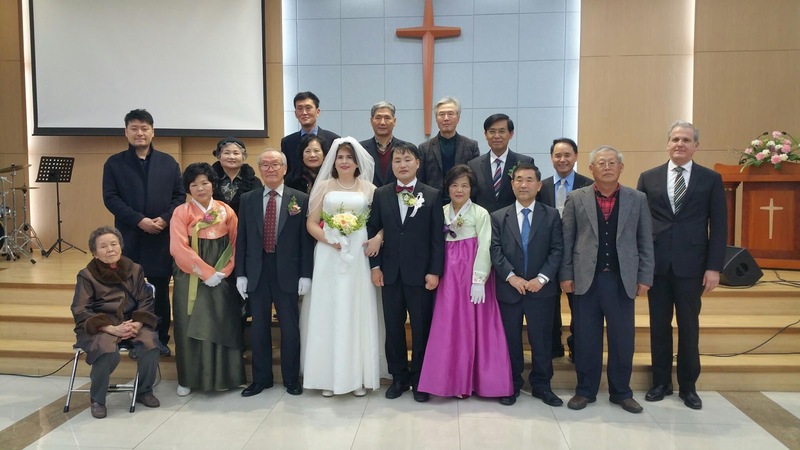 After attending the wedding between Sarah Brown and Joon Soon Kim, the next day (Sun) Timothy Ha of Chongno and I moved to Chunjoo and attended worship service at Chunjoo (I) UBF Bible Center located across the street from the Jeon-Book University. The worship started at 11:00 am. Shepherd Moses Park served a message, "Return to me" (Malachi 3:6). 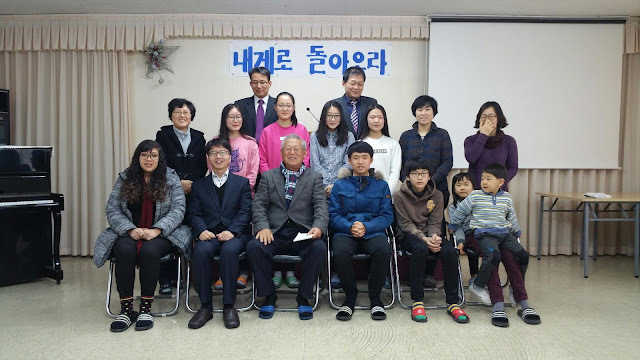 In his message Moses exhorted the congregation to repent, turn to the Lord and serve Him with the sense of history and global mission vision in mind. Shepherd Moses became a believer from mother's womb. Yet during his young adulthood he fared without knowing the Lord "in PERSON". But one day when he tyrned 16, he stumbled into a prayer meeting where he met the Lord in person when he heard a message saying "...he was PIERCED for our transgression." Around that time he suffered a lot due to the foot injury after he had accidently stepped on a nail. The message pierced his heart. He met Jesus who made him whole through suffering and death on his behalf. While he was in collage at Jeonbook University he was led to UBF. At that time he was thirsty of the word. He had the desire to study the Bible deeply. 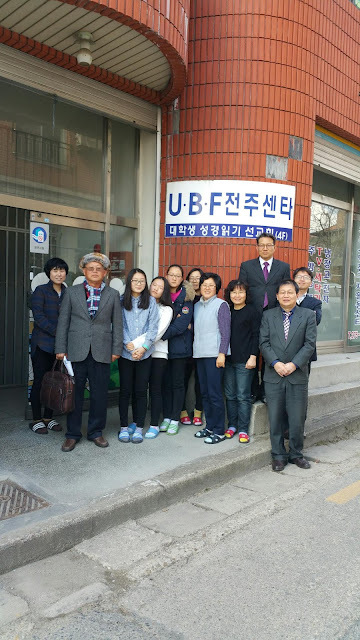 The 'Bible study at UBF satisfoed his deep dedire to deeply study the Bible. Now he served the student ministry as a staff shpherd still working full time as an asset manager at a financial institution. There are 5 shepherd families in Cheonjoo UBF I.
I had a talking eating and prayer fellowship with leaders including Heekwan Lee husband (pass@camtic.or.kr; 010-8629-0064), Barnabas Hong (banabashong@hanmail.net; 010-9516-7122). 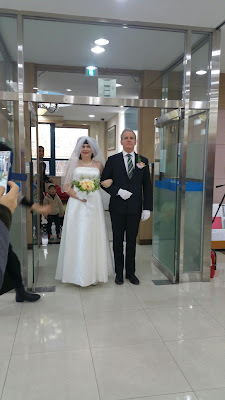 There was a wedding in Kwangjoo. # Wedding sermon on: Genesis 15:5 "So shall your offspring be"
Sarah Brown grew up in a believing family where her parents faithfully served the Lord at a local church. Sarah's younger brother Philip led her to UBF to study the Bible. Now she is a treasurer at Maryland UBF. Joon Soon is a musician. There is virtualy no musical instrument which he cannot play. 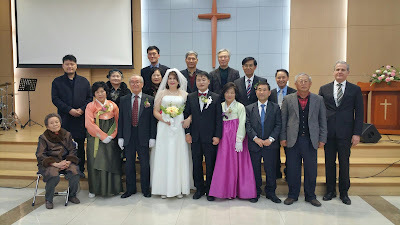 Brother Joon Soon will follow the Bride to run a house church serving the campus mission at he Collage Park Maryland. Missionary Samuel Yoo (MD) will go next week to Ethiopia as a "consultant" dispatched by KOICA (Korean International Cooperation Agency) on a two year contract. He and his wife Mary will be stationed at a university in Zima a city located about 5 hours away to the southwest from Addis Abbaba. The Korea International Cooperation Agency was founded as a government agency on April 1, 1991, to maximize the effectiveness of Korea's grant aid programs for developing countries by implementing the government's grant aid and technical cooperation programs. (About a year ago he moved to Swaziland to open a ministry but things did not work out.) 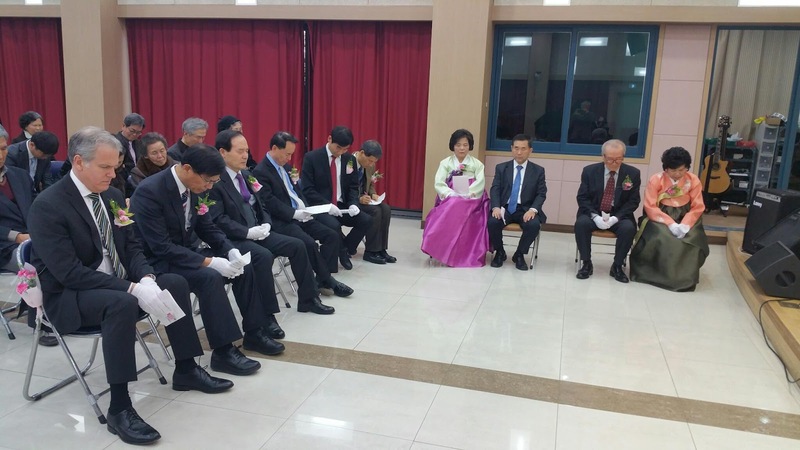 Last October he learned of the Koica looking for candidates to go out to depressed areas to impliment government aid programs. He applied for the venture. Koica accepted. 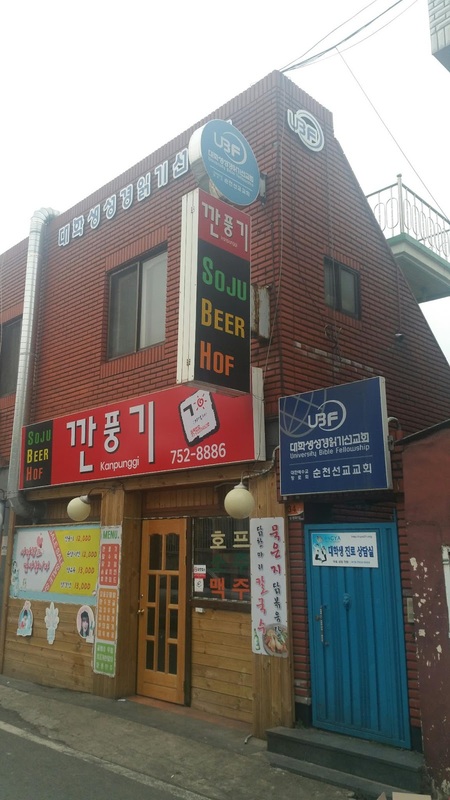 Now he finished the training in Seoul Korea. 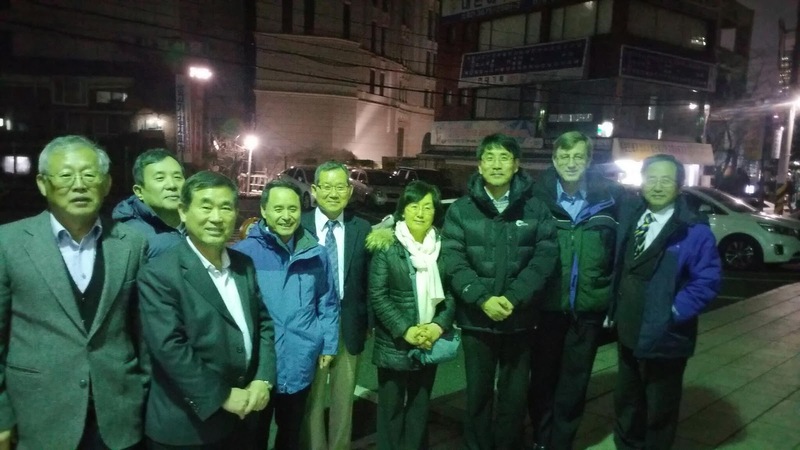 Yesterday after finishing a meeting UBF International Executive Board members had a dinner together with Mary and Samuel Yoo and took a picture.